Chocolate Meringue Cookies are a combination of ideas including macarons, chocolate drizzle cookies, and of course ice cream sandwiches! Preheat oven to 250 F (120 C) and line a baking sheet with parchment paper. In bowl of stand mixer with whisk attachment on medium high speed, beat egg whites stiff like clouds. Leave mixer on and slowly spoon in sugar a Tablespoon at a time. Whisk until stiff peaks form. Mixture should be firm and shiny. Spoon meringue mixture into piping bag. Pipe each meringue from the edge of the circle inward clockwise, and lift in the center to create a tip. Bake for 90 minutes. DO NOT open oven door while baking or meringues will crack. At 90 minutes, Turn Oven Off and allow meringues to cool inside oven. (About an hour). Remove pan from oven and prepare chocolate drizzle. Put the 2 oz. of chocolate in a microwave safe bowl and heat for TWO-THREE 30 second intervals, stirring in between. 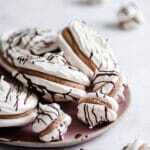 Once chocolate is melted, take a spoon and drizzle over meringues. Transfer pan to refrigerator, to set the chocolate. In a saucepan on medium heat, warm your heavy cream. Add 4 oz dark chocolate chunks and continue to stir until melted. Remove chocolate cream from heat and let cool to room temp. Pipe or dollup chocolate ganache cream onto meringue shells and sandwich together. Store Chocolate Meringue Cookies in the fridge!